Loading steel coils at Essar Steel, July 15, 2012. 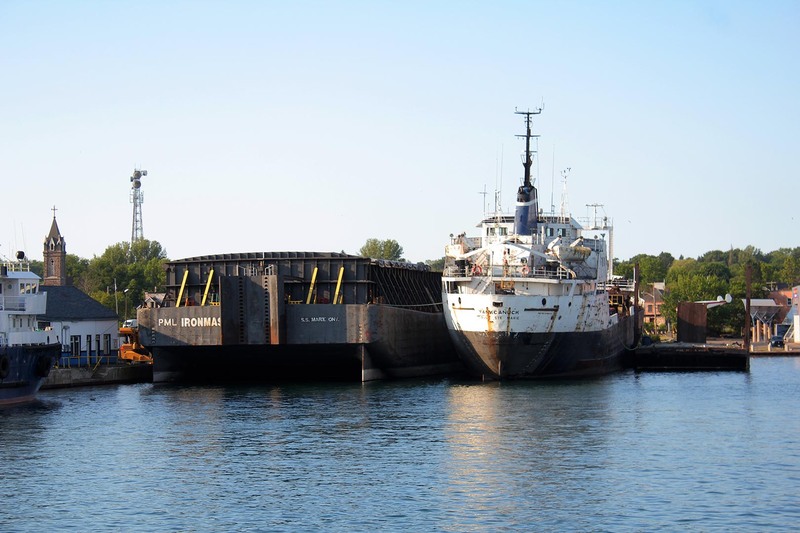 The Purvis Marine barge PML Ironmaster (C834135) arrived at Sault Ste. Marie, ON, under tow of the tug Reliance in December 2009 and began Great Lakes service the following year. The vessel had been built by Yarrows Ltd., Vancouver, BC, in 1962 as Seaspan 241 and operated between Alaska, Hawaii and Central America. The 338' long by 75' wide by 25' deep barge was registered at 4,635 gross and 1,390 net registered tons. It was later sold and renamed Ceres, American Gulf VII, Ceres (again), GT Steelmaster, and GT Ironmaster before joining the Purvis Marine fleet as PML Ironmaster. It was registered in Sault Ste. Marie, ON., on December 17, 2009. The barge spent the brutal winter of 2013-2014 locked in ice in the St. Marys River when efforts to being the ship back to Sault Ste. Marie were halted by the harsh conditions. Come spring, the PML Ironmaster was released and able to resume normal company service. She is most often employed moving rolled steel coils from Essar Steel in Sault Ste. Marie, ON, to lower lakes ports. Adapted with permission from "The Ships of the Purvis Marine Fleet" by Buck Longhurst, Skip Gillham. American Gulf VII 1984 - ?? GT Steelmaster 1990's - ?? The tug Reliance towing the Ironmaster past Mariatown on the St. Lawrence, Dec. 18, 2009. Close up of the barge. Upbound at Port Huron towing the barge Ironmaster, April 14, 2012. Close up reveals Ironmaster's former names. Stuck in the ice on the St. Marys River, Jan. 28, 2014. A size comparison to the Yankcanuck, June 24, 2016. Copyright � Boatnerd.com. All Rights Reserved.